christineiscooking.com: 2 Ingredient Nutella-Yogurt Fruit Dip (Amazing Tasting)!!! 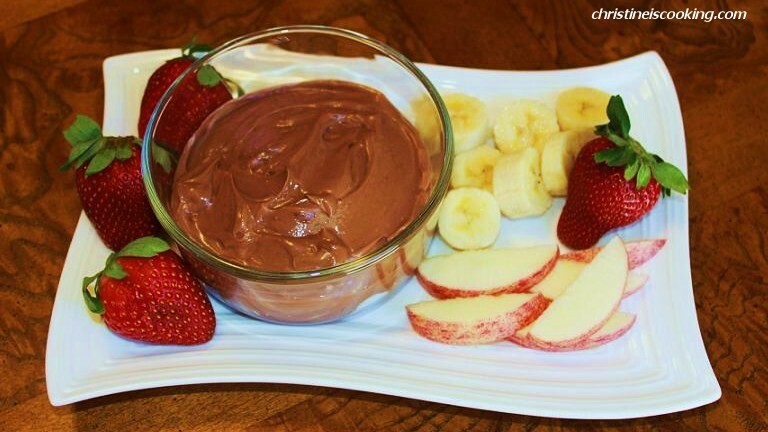 2 Ingredient Nutella-Yogurt Fruit Dip (Amazing Tasting)!!! There is nothing better then a "recipe" that is amazing tasting, but only requires a few ingredients and takes just a few minutes to make. This Nutella - Greek Yogurt Fruit Dip qualifies as super yummy and super easy. That's it!! There is no right or wrong way to make this dip. You can change the amount of yogurt to make it more or less chocolatey. The end result is similar to a delicious chocolate mousse. This dip is great for parties to compliment a fruit tray or as a side to fruit in a school lunch as a way to add protein. Plain Greek Yogurt usually comes in 0,1 and 2% fat. The higher fat content of the yogurt, the richer the dip will taste. If I am making this for a party I usually use 2% fat plain Greek yogurt.